“They were with me last night, but now everything’s a blur. I can’t even call because I woke up with someone else’s cell phone in my pocket…don’t ask me what else.” One of the first conversations I overheard on my debut solo stroll around Amsterdam, ladies and gentlemen. I was predictably alarmed, but now, having experienced the eclectic nature of a city so often misunderstood, I can look back and chuckle. The only other time I had ever visited the Netherlands was as an infant. So it’s understandable that my discomposure on the first day was based on my limited knowledge of the capital and my aversion for being alone but — as I soon grasped — I couldn’t have been in for a more pleasant surprise. 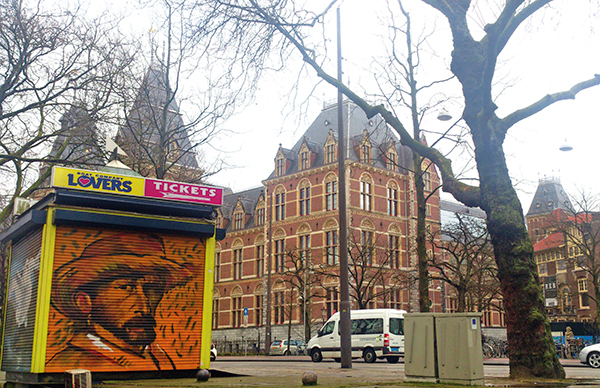 The first thing to bowl me over was my arrival at the hotel in Museumplein, the heart of the city’s cultural square. Having sprinted from the airport to a car through bracing wind peppered with icy rain, all I wanted was to hurl myself at a warm bed but, as we pulled up to an overwhelming Neo-Gothic facade, I knew that my forty winks would have to wait. The Conservatorium Hotel demanded so much more attention. Here, a raw structure and vintage accents tastefully merged with sleek lines and modern glass elements to create a mysterious, larger-than-life aura that could not be ignored. No glossy cookie-cutter hallways, no tacky baubles, no nonsense. So, as I walked through hidden doorways and seemingly-infinite corridors, I vowed to leave only after having explored the enigmatic property. 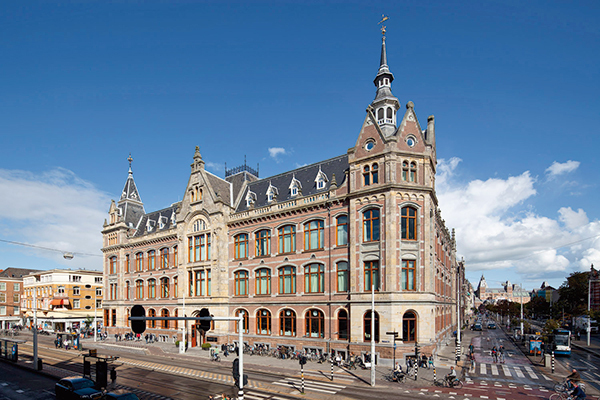 A tidbit that I did immediately learn was that, originally, the building was designed as the Rijkspostspaarbank, by a Dutch architect named Daniel Knuttel. The bank became a defining architectural icon of the city before moving office, leaving the building abandoned in 1978. Years later, the structure became home to the Sweelinck Conservatorium or Conservatorium van Amsterdam — the largest conservatory in the Netherlands — impacting the history of professional music training in Amsterdam. When the school outgrew its home and moved in 2008 to Oosterdokseiland, award-winning Milan-based designer Piero Lissoni swooped in to work his magic on the original facade. Minimalist, stylish and unquestionably comfy with the classiness of the finest hotels, what continues to stand as Knuttle’s masterwork on the outside was transformed by Lissoni into his own magnum opus on the inside. 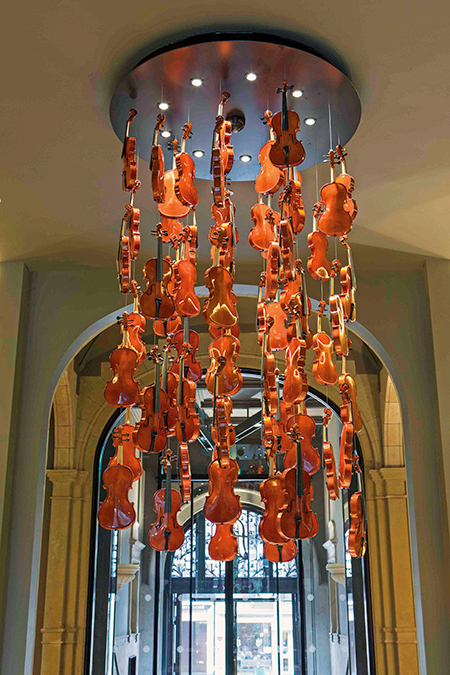 The luxury hotel still honours its namesake with music-related artefacts adorning many a nook and crevice, and students from the school often come over to perform. One of the lobbies even has a violin chandelier and, at the cigar shop, I was impressed to see a grand piano filled with Cuban cigars. Walking with my eyes wandering the lofty ceilings, I was ushered into my room which, in all honesty, left me confused at first. I was greeted by a wall-to-wall window that allowed daylight to stream in and cast an ethereal glow around a living area. Wait; what? Turning around to see a massive couch, flat-screen television, breakfast table and a large bathroom, I almost asked myself whether the couch was a pull-out. That was until my eyes reunited with the ceiling, and I noticed that the window continued right up to the top of the room…where a sprawling loft-like level awaited my discovery. A discreet staircase, which had eluded me before, led me up to what I can only describe as my personal paradise, where a lush white bed took up almost half of the entire level. Within seconds, I was tucked in and the floor-to-ceiling digitally-controlled blinds were drawn, leaving the room in complete darkness — which is probably why I didn’t realise, until a day later, that there was a master bathroom concealed behind the wall next to the bed. I blame my love for sleep. Later that day came my time to explore the neighbourhood on my first walk, the start of which you’re aware of. It wasn’t originally intended to be a walk because I, of course, had to do as the locals do and borrowed one of the hotel’s cycles. Now, I learnt to ride early on in life and I knew I was fairly good at it. But, as I discovered, not good enough for the streets of Amsterdam. Here, cyclists are at the top of the food chain, something that even drivers know and respect. The bicycles outnumber the residents in the city, who cycle to important meetings every day and have no patience for amateurs. So it’s safe to say that after cruising out of the hotel courtyard, I had a mini heart attack every five minutes. Once I had scared myself enough, I abandoned my plan to cycle around the city and peddled into the Vondelpark close by. The largest green space in the city, it is dotted with bandstands, ponds, food carts and weeping willows. Without traffic around, I enjoyed cycling alongside joggers and skaters before returning the death machine and strolling in the direction of Amsterdam Centraal. Gloved hands in my coat pockets, beanie on and hood up, I was navigating my way through merrymaking groups, unnoticed and strangely at peace, when I heard an indescribably haunting version of one of my favourite songs. Before I realised it, I was following the voice. 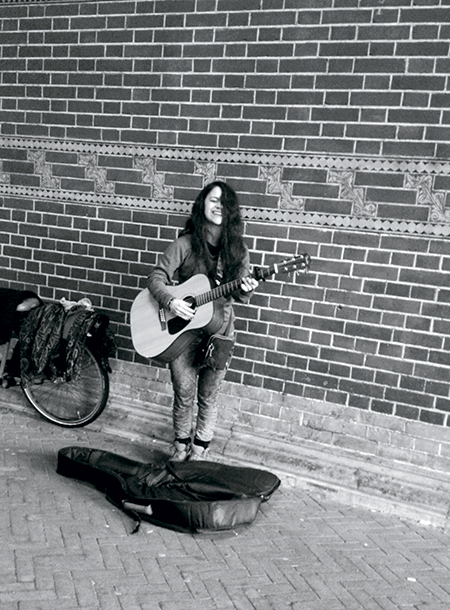 I found her under a large archway, standing against a brick wall with her guitar in her hands and eyes closed; I was spellbound. ‘Crumbling like pastries, and they scream, the worst things in life come free to us’ — we stood there singing quietly for a minute that felt like an hour to me. Beaming, she told me her name was Nina, thanked me for living in the moment and allowed me to take a photograph to remember her by. Forgive me if this sounds corny, but that instance set the course for my experience. The rest of my time was spent walking wherever my legs would take me, drinking coffee atop bridges in Jordaan and even enjoying high tea aboard a vintage boat named Ivresse. What remained a constant through it all, though, was food. Amsterdam has enough variety for one to sample local delicacies throughout the day and revel in the wonderful produce at every corner. No one loves street food more than I do, but the gastronomic delights at the hotel didn’t make it easier for me to decide between heading out for a herring sandwich (a must-try salty fish specialty found on carts throughout the city) and staying in for a contemporary Asian meal at Taiko. 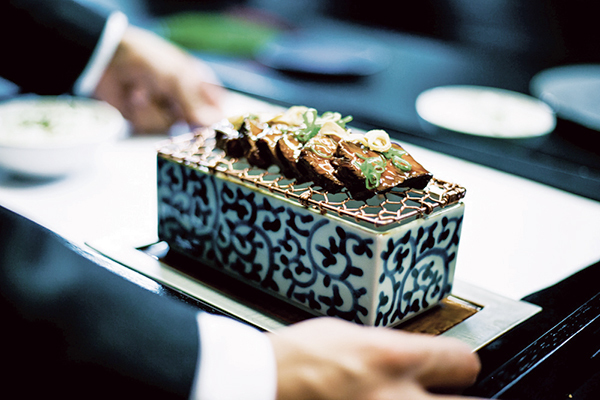 Standouts here are the black cod with green miso, the Wagyu Kobe beef and the iced sake.